So says biologist Dean Kenyon. Kenyon spent much of his early career looking for a naturalistic (evolutionary-based) explanation for how life could have begun on its own. His theory was presented in this book Biochemical Predestination. But his theory began to unravel under challenge. The evidence weighed too heavily in favour of a very intelligent Designer behind the origin of life. What is this most compelling evidence for design that finally pushed him over the edge? It’s one of the fundamental Fingerprints of God that I’m covering in this series. Here’s background information for you, and an activity will come in my next post for you to do with your children. The evidence that convinced Kenyon that life had to have been designed by a supreme intelligence was DNA. Francis Collins called DNA ‘the language of God”. DNA acts like a library where information needed to build critical components in biological organisms is stored. Essentially, it contains the instructions on how to build life. The DNA information storehouse operates a finely choreographed manufacturing process in which the right amino acids link together with the right bonds in the right sequence to produce the right kinds of proteins that fold in the right way to build biological systems. DNA is far more sophisticated than any computer language we’ve ever developed. It’s also extremely specific and absolutely necessary to build life. 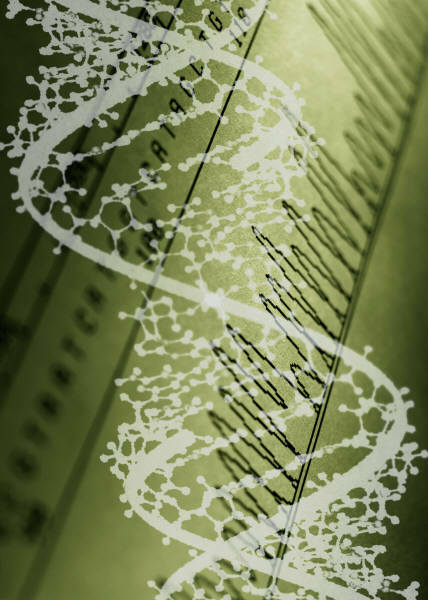 Just as you can’t explain the contents of a book by explaining how ink sticks to paper, we cannot explain the origin of life without explaining how we got the genetic information (DNA) necessary for life (that’s Stephen Meyer’s illustration). Under evolutionary theory, simple organisms must gradually evolve into more complex ones by developing new features and functions. But, for an organism to acquire a new feature or function, information (instructions for how to build it) must be provided from somewhere within the cell (i.e. through DNA). There is really no chance of this happened on its own. You need at least 75 of the right type of amino acids lined up perfectly to build a single functioning protein on which to build life. The chance of this happening all on its own is 1 chance in 10 with 125 zeros after it (i.e. ridiculously improbable – it would be much easier to win the lottery jackpot every single week). Natural selection does not work at the level of chemical evolution. There’s no chemical explanation for DNA. Mutations cannot explain the origin of DNA. We have no evidence of an organism that does not require the genetic information stored in DNA. RNA is still too complex and the jump to DNA too great to suggest DNA evolved from RNA. So, where did it come from? I suggest DNA is one of God’s fingerprints, buried deep inside every living thing, providing a quiet testimony of His character and intelligence. Want more? Watch this short video. ← Fingerprint #4: Machines Inside Us!